Every so often I am reminded just how lucky we are to be living where we do, and last Saturday was one of these occasions. The Jeff Koons retrospective currently on show at the Whitney Museum has received a mixed reception from the critics, but given that it is taking place a mere half-mile from our front door there was no excuse for missing it, and we strolled along to join the admissions queue after breakfast. Overall we were rather taken with the show. Previously Koons was familiar to us only from his more eye-catching work: metallic balloon sculptures and gigantic floral animals. Organized chronologically around phases of Koons’ work, this exhibition was fascinating as it allowed us to see his development as an artist (or lack thereof, depending on your view), and highlighted themes to which he keeps returning (particularly kitsch, consumer-culture, and shiny things). 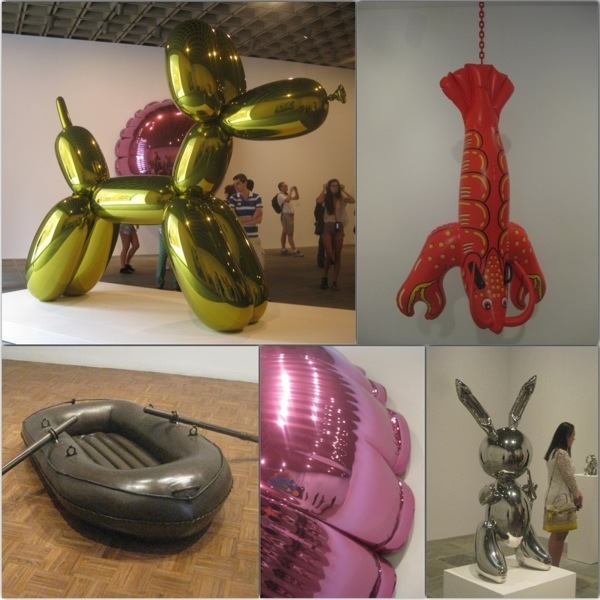 Before we went I was interested to read about Koons’ extreme perfectionism, and this was certainly apparent in the art – in particular his metal versions of inflatables looked SO real they were almost disturbing. This is one of the themes he has addressed repeatedly, with earlier bronze casts of a rubber dinghy and lifevest followed by shiny metal rabbits, the famous balloon dogs, and a series of pool toys you would swear were the actual article. 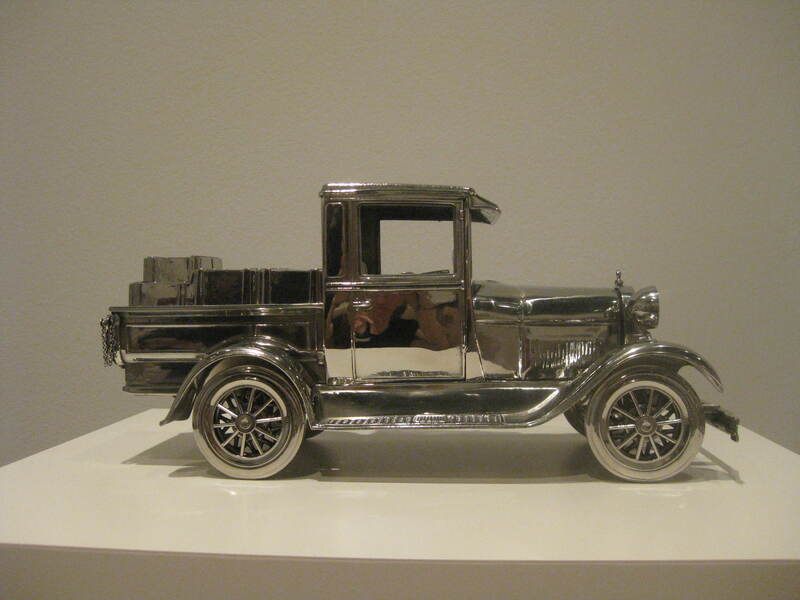 I was rather taken with a couple of pieces in one of the earlier galleries – a multi-carriage train and a model car made of shiny stainless steel. At first glance they looked like yet more metallic toys, but then you realised that they were actually novelty containers for alcohol. I don’t believe I’ve ever read “stainless steel and bourbon” on a gallery label before. The interesting bit is that in order to drink the booze you’d have to damage the artwork, which I suppose is not so much of a dilemma if you’re rich enough to buy original art in the first place, but it amused me nevertheless. I could go on a lot more about this, but I won’t. Suffice it to say that it was an extremely well-curated exhibition, and despite the fact that pop art isn’t something either of us usually have a huge amount of time for we both enjoyed it very much indeed. 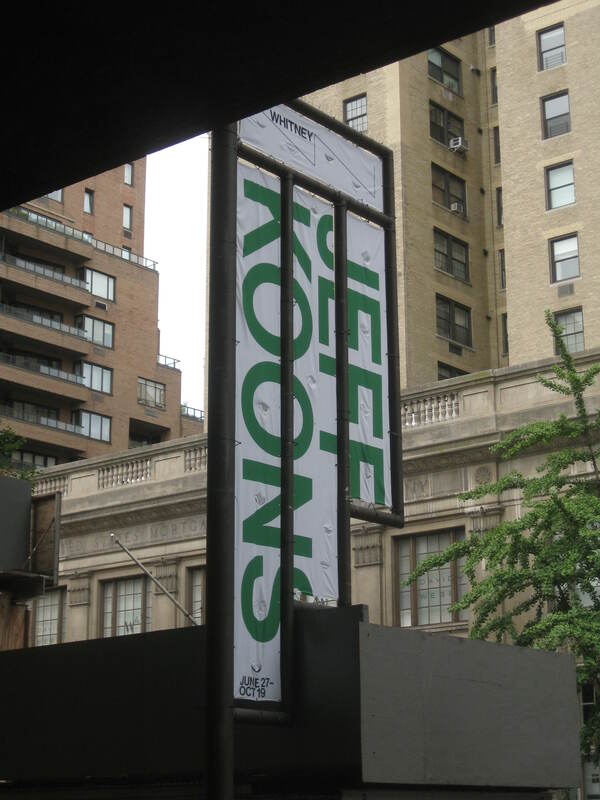 This entry was posted in Museums/galleries and tagged Jeff Koons, Whitney Museum by Emma Davidson. Bookmark the permalink.